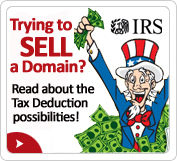 If you own premium domain names and are looking to sell a single domain name or liquidate your entire digital real estate portfolio, consider donating domain names instead. When you donate a domain name, we go the extra mile to make sure your donation benefits all involved. You as the generous domain name donor are entitled to an Appraised Value Tax Deduction, Free Vacation and the self satisfaction of knowing you have Made a Difference in someone's life. Learn about the important causes your donation supports.